Gabriele Susanne Kerner (born 24 March 1960), better known by her stage name Nena, is a German singer and actress. 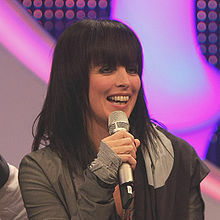 She is best known for the New German Wave song "99 Luftballons". In 1984, she re-recorded this song in English as "99 Red Balloons". ↑ "Nena (Biography on Pandora)". Retrieved 2011-11-13. Wikimedia Commons has media related to Nena. This page was last changed on 13 February 2019, at 15:39.